This Hampton Bay ceiling light is beautifully from a modern take on a classic look that will enhance many styles of home decor. The protective chrome finish will provide a sparkle to any room, and the frosted white glass shade provides even light -no dark spots or shadows. The money saving LED light source built into this ceiling light uses 80% less electricity than incandescent light bulbs, and there are no bulbs to replace. The fixture is easy to install, and it's great for most medium sized rooms. 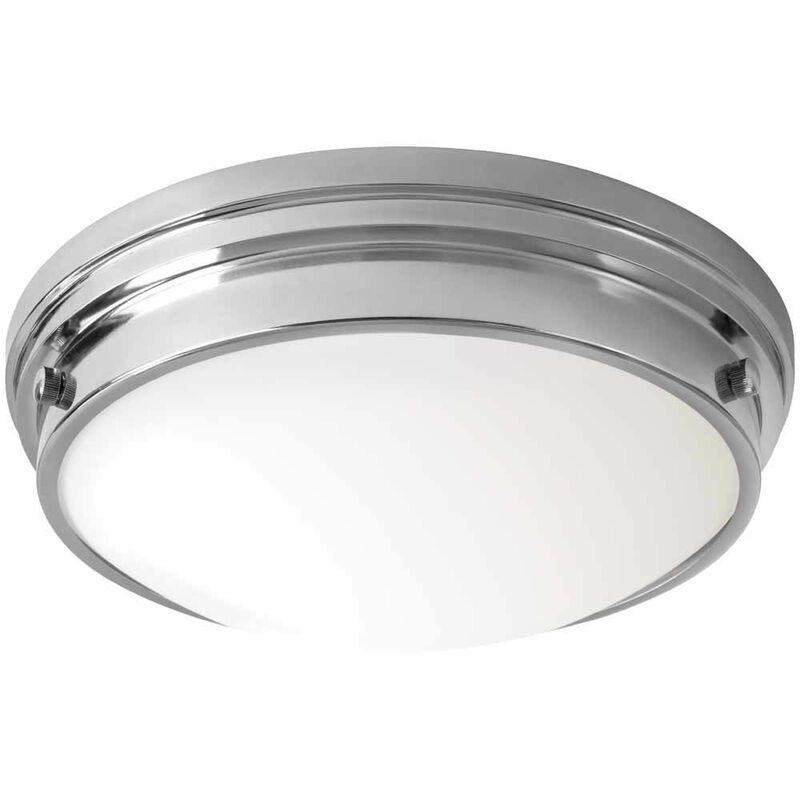 Hampton Bay LED Ceiling Flush Mount with frosted glass shade. Includes brushed nickel decorative clips to hold the glass in place. Integrated LED module built into the fixture offering 50,000 hour lifetime. No bulb to replace and virtually maintenance free. ENERGY STAR Certified to help save money, energy and the environment. Energy saving product, great for hallways, bedrooms, stairways, basements, garages, indoor porches and any other area where a high quality LED light source is required. Featuring a Volterra bronze finish with silver accents, this traditionally styled flush mount is a great choice for updating your hall or entryway. The clear and frosted glass dome is eye-catching and elegant. This fixture will be a sparkling addition to your home. 13-inch Chrome LED Flushmount Ceiling Light with Frosted White Glass Shade - ENERGY STAR This Hampton Bay ceiling light is beautifully from a modern take on a classic look that will enhance many styles of home decor. The protective chrome finish will provide a sparkle to any room, and the frosted white glass shade provides even light -no dark spots or shadows. The money saving LED light source built into this ceiling light uses 80% less electricity than incandescent light bulbs, and there are no bulbs to replace. The fixture is easy to install, and it's great for most medium sized rooms.